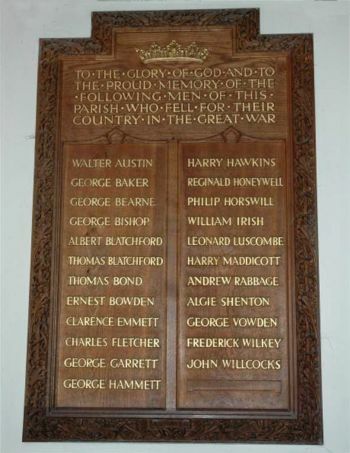 The First World War Memorial in St. Andrew's Church, Ipplepen. Officer's Steward 1st Class Walter Frank Austin of the Royal Navy, HMS Vivid. Son of George and Mary Austin of Ipplepen and husband of Margaret (née Jury) (They had just married in May 1918). Born in St. Marychurch in the March Quarter of 1895. Died 29 July 1918 aged 23. Buried in Torquay Cemetery. Leading Signalman George Bearne of the Royal Navy, HMS Amphion. Son of (the late) Andrew and Mrs. Emma Bearne of 3 Bridge Street, Ipplepen. Born at Littlehempston in the December Quarter of 1885. Died 6 August 1914 aged 29. Name not on church memorial. Private Alfred John Bishop of the Royal Army Service Corps, the Yeomanry Remount Depot. Son of John Henry and Susan Ann Bishop and husband of Bessie Blanch Bishop of 2, Poplar terrace, Ipplepen. Born Died 9 April 1921 aged 25. Buried in St. Andrew's Churchyard, Ipplepen. George Bishop was the son of William and Mary Bishop, formerly of Blackstone, Ipplepen. He was born in the December Quarter of 1883 in Ipplepen. His military record is not yet confirmed. Leading Stoker Albert Blatchford of the Royal Navy, HMS Goliath. Son of Joseph and Elizabeth Blatchford. Born in Ipplepen in the June Quarter of 1890. Died 13 May 1915 aged 25. Private Thomas Blatchford of the Royal Marines, HMS Defiance. Son of John and Ann Blatchford of Lylesford, Ipplepen. Born in Meavy in the December Quarter of 1877. Died 31 May 1916 aged 38. Son of Edwin and Minnie Bond of Ipplepen. Born in Ipplepen in the March Quarter of 1895. His military record is not yet confirmed. Private Ernest F. Bowden of the 14th Battalion, the Gloucestershire Regiment. Son of Frederick and Dora Bowden of Ipplepen. Born in Ipplepen in 1896. Died 16 September 1917 aged 20. Private Clarence Southwood Emmett of the 4th Battalion, the Wiltshire Regiment. Son of Thomas Hedley and Annie Emmett of Cross Park, Ipplepen. Born in Ipplepen in the December Quarter of 1899. Died 8 February 1919 aged 19. Gunner Charles Fletcher of "B" Battery, 88th Brigade, the Royal Field Artillery. Son of Charles and Janet Fletcher of North End Farm, Ipplepen. Born in Ipplepen in the June Quarter of 1898. Died 14 April 1918 aged 20. Private George Garrett of the Depot, the Devonshire Regiment. Died 18 April 1917. No other details have yet been confirmed. Gunner George Henry Hammett of the 14th Siege Battery, the Royal Garrison Artillery. Son of Frederick and Emma Hammett of North View Cottage, Ipplepen. Born in Ipplepen in the September Quarter of 1892, Died 23 May 1915 aged 23. Gunner Harry Hawkins of the 57th Siege Battery, the Royal Garrison Artillery. Son of Harry and Harriet Hawkins and husband of Amelia Hawkins of The Croft, Ipplepen. Born in Ipplepen in the September Quarter of 1886. Died 5 December 1917 aged 31. Private Philip Holmes Horswill of the 8th Regiment, the South African Infantry. Son of Philip and Eliza Horswill of Bridget Street, Ipplepen. Born in Ipplepen in the March Quarter of 1877. Died 19 July 1917 aged 40. He was a South African citizen. Private William Thomas Irish of the 8th Battalion, the Somerset Light Infantry. Son of Thomas and Susan Irish of Ipplepen. Born in Ipplepen in the June Quarter of 1888. Died 18 September 1918 aged 30. Private Leonard Luscombe of the Royal 1st Devon Yeomanry. Son of William and Bertha Luscombe of Ipplepen. Born in Ipplepen in the September Quarter of 1894. Died 26 October 1918 aged 24. Private Harry Maddicott of the 20th Indian Infantry Brigade Train, the Army Service Corps. Son of William and Jane Maddicott. Born in Ipplepen in the March Quarter of 1888. Died 27 October 1918 aged 30. See the Village War Memorial page for more information about this man. Corporal Andrew Rabbage of the 46th Field Ambulance, the Royal Army Medical Corps. Son of Robert and Louisa Rabbage of Ipplepen. Born in Ipplepen in the June Quarter of 1894. Died 28 Jul 1918 aged 24. Awarded the Military Medal. Bombardier Algie John Shenton of the 110th Battery, 204 Brigade, the Royal Field Artillery. Son of James and Charlotte Shenton of Staverton. Born in Staverton in the March Quarter of 1895. Died 27 May 1918 aged 23. Private George Albert Vowden of "C" Company, the 8th Battalion, the Devonshire Regiment. Son of (the late) James and Mrs. Annie M. B. Vowden of 139 East Street, Ipplepen. Born in Ipplepen in the September Quarter of 1894. Died 6 September 1916 aged 22. Private Frederick James Wilkey of the 2nd Battalion, the Devonshire Regiment. Son of the late Mr. and Mrs. E. Wilkey. Born in the December Quarter of 1894. Died 18 December 1914 aged 20.